The Childcare Resource and Research Unit has periodically assembled pan-Canadian data to produce a national snapshot of child care and early childhood education. 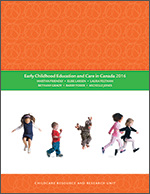 The fifth edition of Early childhood education and care in Canada presents 2001 data. Together with 1992, 1995 and 1998 data compiled for earlier editions, these data reveal several trends in ECEC over the decade. In keeping with current conceptions and development of the early childhood education and care field, this edition adds cross-Canada information on public kindergarten to provincial/territorial information about regulated child care, maternity and parental leave and relevant demographic information. It also includes an examination of: the state of ECEC in Canada, federal ECEC programs, and Aboriginal ECEC. The full text of ECEC in Canada 2001 is available in pdf format from the links below.